Use tweezers to sculpt your brows at home. Brows are often referred to as sisters, and not twins, but sometimes they like to get a little too close for comfort. 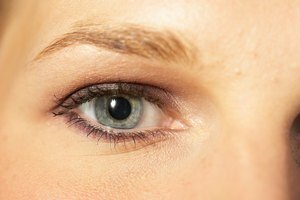 While everyone has hair that grows between their brows, those with dark hair often find it to be more noticeable. The connecting hair creates a unibrow effect, and makes brows look less defined and complimentary to your face. Put some distance between your brows, and add instant shape, by grooming your unibrow. Position yourself in front of a well-lit magnifying mirror to get a clear view of the hair between your brows. Brush your brows upward using a spoolie brush, starting from the middle and moving toward the side closest to your nose. Hold a small pair of scissors horizontally, with the points facing the outside of your face. Carefully trim any hair on your inner brow that sticks up above the rest so that the hair is the same length as the majority of the brow hair. Concentrate on the 1/2-inch section closest to your nose. Repeat on your other brow. This will add shape without removing the hair completely and creating a sparse look. Place a pencil vertically against the side of your nose, so that it touches your nostril and moves straight up over your inner brow. Place the tip of a brown eyeliner pencil beside the first pencil, on the side closest to your nose. Press down gently to create a line that matches the height of your eyebrow. This is where your eyebrow should begin. Place the first pencil alongside your other nostril and inner brow, and create a marking using the same technique. When the hair between your brows is groomed, the inner edges of your brows will be defined without appearing harsh. Rotate the first pencil so that it touches your nostril and the outer corner of your eye before passing through your brow. Place the tip of the brown eyeliner pencil between the first pencil and your brow, and create a dot. This is where the hair will stop to give your brow a neat edge. Repeat on the other side. Place your non-dominant hand on your forehead, and pull the skin taut toward your hairline. This will allow you to get a firm grasp on the eyebrow hair. 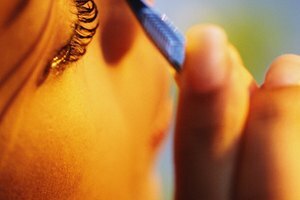 Grasp two to three hairs that fall between the two inner eyeliner marks above your nose, using a set of sharp angled tweezers. Pull the hairs out by the root and in the direction of hair growth. Continue until all hair between the inner marks has been removed. Comb each brow down and out toward the outside of your face, using the spoolie brush. Place your non-dominant hand next to where your brow currently ends, and pull the skin taut towards your ear. 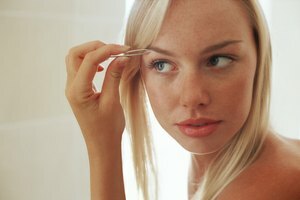 Use the tweezers to grasp the hair that grows at the outer edge of your brow, outside of the brown mark, in chunks of two, and pull them out in the direction of hair growth. Repeat on the other side. Soak a cotton pad in witch hazel, and gently pat it over the area to soothe skin and remove pencil marks. O'Neil, Celeigh. "How to Shape a Unibrow." Synonym, https://classroom.synonym.com/shape-unibrow-22097.html. Accessed 21 April 2019.